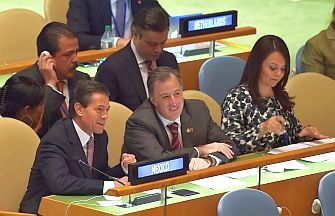 In a speech at the U.N. General Assembly meeting in New York on Wednesday, President Pena Nieto said that Mexico will make the 'historic step' of resuming its participation in U.N. peacekeeping missions. New York, New York - After years of keeping out of the world's conflicts, Mexican President Enrique Pena Nieto announced on Wednesday that Mexico has decided to participate in U.N. peacekeeping missions again, as the government steps up efforts to raise its profile on the global stage. While in New York, the Mexican President told the U.N. General Assembly that "Mexico has taken the decision to participate in U.N. peacekeeping missions; to take part in humanitarian tasks that benefit civil society. Mexico supports and values these operations as an instrument to help countries overcome conflicts and create conditions for lasting peace." Pursuing a traditionally low-key foreign policy, Mexico has only been involved in three peacekeeping missions in its history, the last time in 1992-1993 when it sent 120 police officers to El Salvador. In a statement, President Pena Nieto's office said that "Mexico's participation would happen gradually and could include both military and civilian personnel, including engineers, health workers, military and political observers, as well as other specialists." Any future deployment of Mexican military for missions beyond the nation's borders would require approval from the Senate, but there are no impediments in the constitution and no legislative changes that would be necessary. It has been more than 60 years since Mexican military personnel were included on peacekeeping missions. In the late 1940s, Mexican military observers were sent to the Balkans and Kashmir. 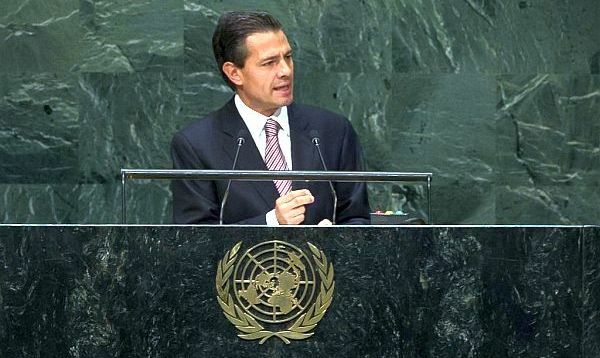 Pena Nieto also called for changes to the United Nations and "more equitable geographical representation" within the U.N. Security Council. He said he also supported limiting veto rights in cases of "severe violations of international humanitarian law." The five permanent members of the Security Council - the US, China, Britain, France, and Russia - all have veto rights over U.N. actions. "We believe that the number of non-permanent members of the Council should be expanded, creating long-term seats with the possibility of immediate re-election," the Mexican President added. "That would require breaking inertias and changing paradigms," Pena Nieto said, calling on all governments to have the willingness to listen, engage in dialogue, and compromise with the aim of achieving "a new U.N. for a new century."